One of the first struggles I had when I got Marley was trying to find places to take him. There was very little information for local dog-lovers – so I did some research, made some calls and put everything I found right here. I’m dedicating this page to local news, dog events and my favorite doggie peeps. If you have a tip or place you’d like me to add, post a comment below with the info so I can add it to the page! Thanks! Pawprints is one amazing place. The people are fantastic and it’s a great way to socialize your pup. It’s only $12 for a half a day (5 hours) or $25 for a full day. Overnight boarding, including day care, is $38 – and they are never alone. A Pawprints staff stays with them in their upstairs sweet. It’s like a doggie slumber party (minus the pillow fights). They are also known for their pond parties – which is loads of fun. Dog training is incredible. It cost only $35 for them to come to my house and meet Marley and work with him for about an hour and a half. I learned a TON and saw major improvement immediately. Group training is only $16 a session (totally worth it). You can drop in or you can buy a package and get a discount. I honestly don’t know who has more fun there – me or Mar! Walton Rocks ROCKS! 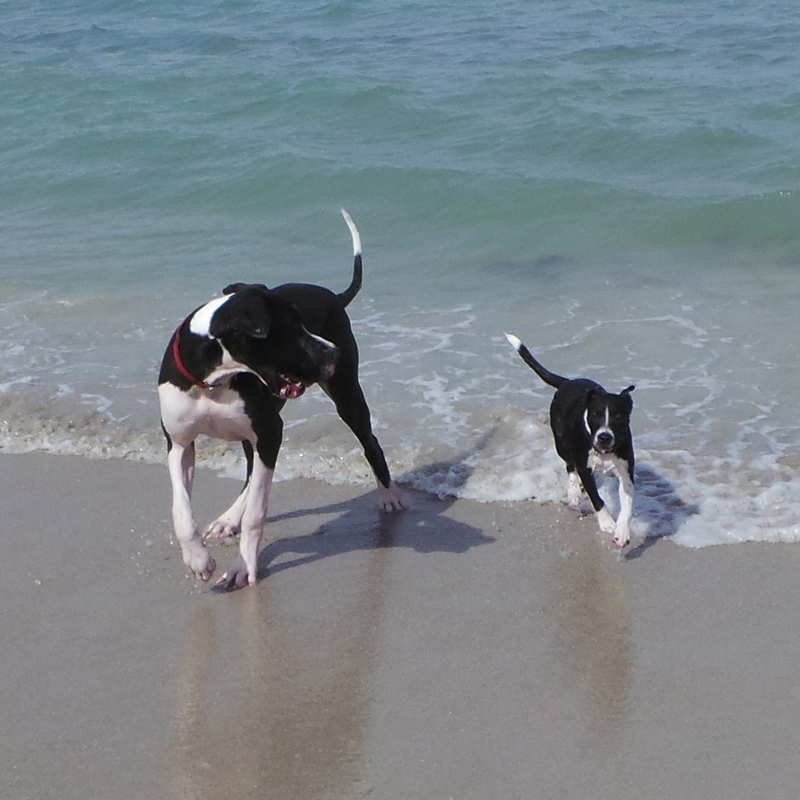 This is a pic of Marley’s first trip there (where he found his Mini-Me friend!). It’s about 20 miles south of Vero on A1A in Fort Pierce (Hutchinson Island), just south of the St. Lucie Power Plant. If you follow iMaps, it will lead you to a secluded (slightly scary) spot right just north of the power plant) that will have you walking forever to find out you are at the wrong place, so ignore MapQuest and look for the signs. This park is located behind the Bob Summers baseball field just north of the east side of the Barber Bridge (behind where the boat ramps are). There is river access if your dog likes to swim. There is plenty of room to play and run, but it is not fenced if you have a runner. People are super friendly. If you want to meet their dog-lovers and dogs, they have a facebook group called Friends of Vero Beach Dog Park. Bob Summers Off Leash Dog Park. This park, as explained above, is located behind the Bob Summers baseball field just north of the east side of the Barber Bridge (behind where the boat ramps are). People are super friendly. 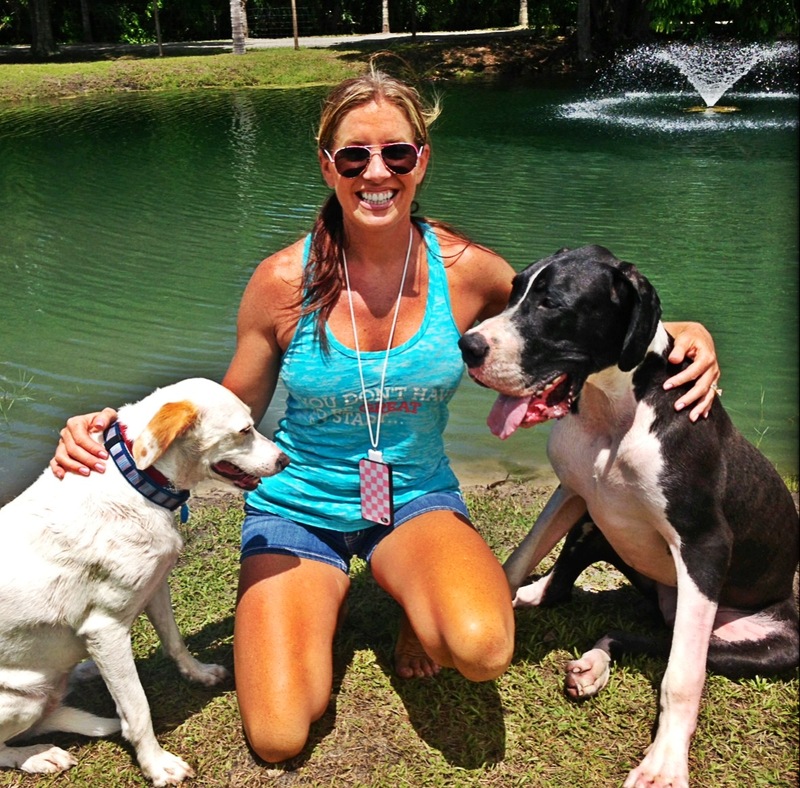 Join their facebook group called Friends of Vero Beach Dog Park. Michael Field, home of Vero’s little league, has a dog exercise area and is open every day except for Saturday. Hours are 6:00 a.m. to Noon (so not to interfere with the ball players). Animals are not to be allowed during other hours. The dog area is unsupervised and owners are responsible for their own animals. Rules are posted at the parks. MacWilliams Park (the boat ramp area next to Bob Summers Dog Park) is offered as an On-Leash Dog Park and is located on Indian River Drive East, North of the Barber Bridge. For more information, call 567-2144. Conservation Trails, Sebastian Inlet. Parking is available at Sebastian Inlet State Park, Wabasso Beach Park (1820 CR 510), and Round Island Riverside Park (2201 Highway A1A). Captain Forester off of Jungle Trail and North Sebastian (click here for photos) off Main Street in Sebastian were highly recommended. Visit www.ircgov.com for more information. 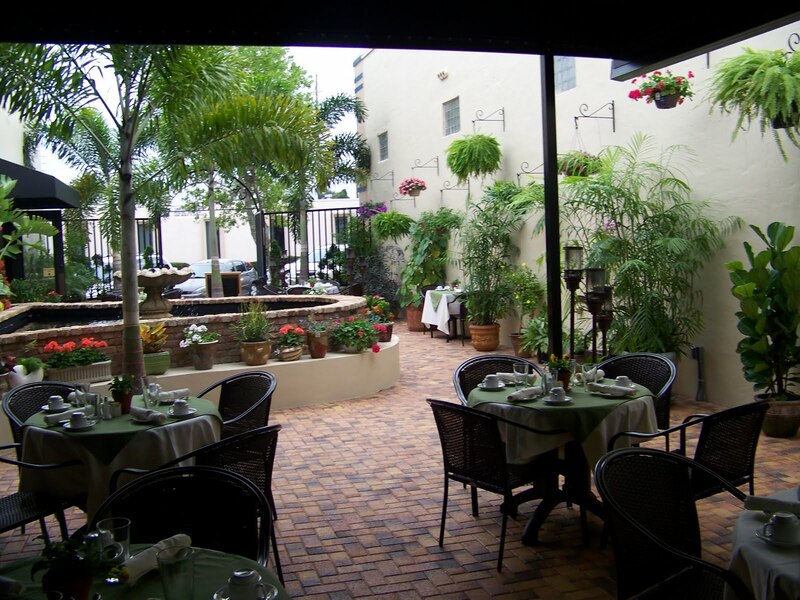 This American-style bistro is located in historic downtown Vero Beach, Florida and is locally-owned and operated by Vero Beach native, Chef Christopher Bireley. The bar’s open-air construction connects you to the garden patio dining area that is populated with dozens of lush plants, growing herbs, seasonal décor and a trickling fountain. Dog friendly dining in front portion of patio. 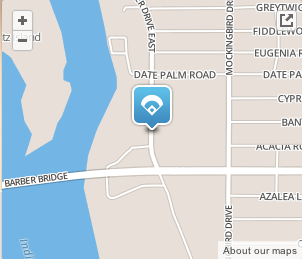 Vero Beach, FL, US 32960. Vero Beach Hotel & Spa allows cats and dogs of any size per guest room for no additional fee. There is no specified limit of the number of pets per guest room. Costa D Este Beach Resort allows two dogs under 45 lbs for no additional fee. Guests are only responsible for any damages or extra cleaning. Dogs are not allowed in the pool, restaurant or beach areas. Sea Spray Inn allows up to two dogs of any size per select guest room for an additional fee of $25 per pet per night. Guests traveling with pets should call 877-411-3436 to verify availability. Boarding, Grooming, Training & Daycare this facility features: 25,000 square foot indoor/outdoor play area, an obstacle course to build skills and confidence, full-service grooming salon & an upscale boutique stocked with all sorts of pet needs and pet-related gifts. Daycare, boarding, grooming, pick-up & delivery service, hurricane boarding. Bark Park Dog Park, One half acre of fenced dog park. Off leash non-profit dog park, memberships are tax deductible. Petco Because it’s a great place to train your dog (if they can obey you with all the distractions of dog bones and pet toys, they can obey you anywhere!). They are all super nice and helpful too! Try their Deer Antlers – it’s an insanely hard bone that is practically indestructible. Lists name of lost dogs, description, location by zip code and reward. What a fantastic blog. I almost bought the property where pawprints is now located. My wife (Cookie) and I looked at every thing there. I regret not making the purchase. It’s a great piece of land and perfect for dogs. I will get some pics of me and “Mugzy”-my three year old Boxer- What a character he is!!!!!!! And I will also include “Zing” a beautiful Chinese Crested that I have on video -TALKING.. REALLY!!!! Dennis Mastrolia. 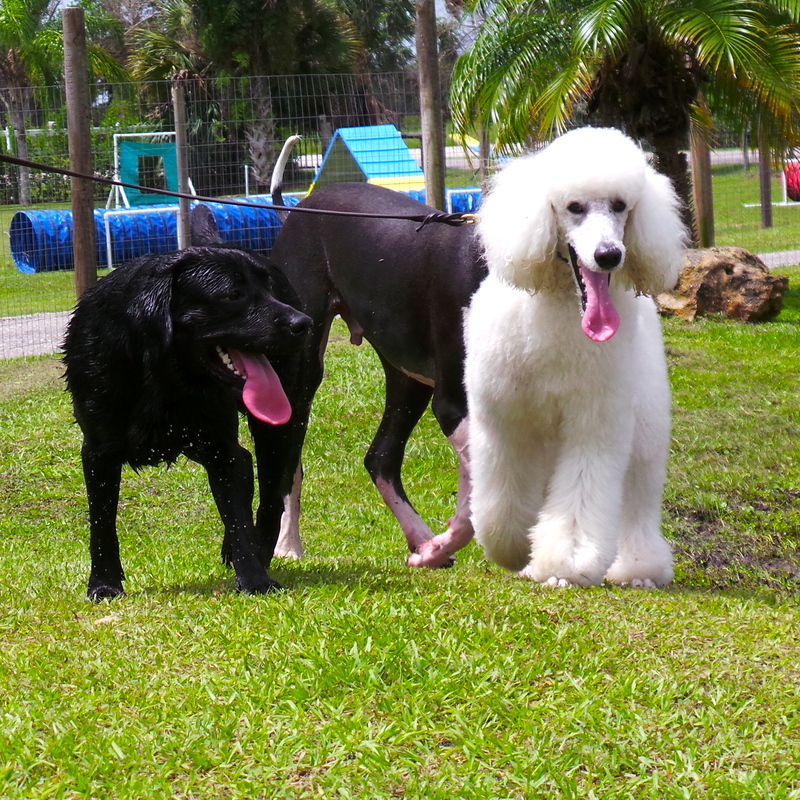 As of March 15, 2014, The Friends of the Vero Beach Dog Exercise Area, Inc. has leased what is now known as the Vero Dog Park from the City of Vero Beach. It is an off-leash, 5-acre dog park, operated, maintained, managed, and funded by the above mentioned nonprofit. Hours are dawn to dusk. It is open to the general public at no charge, and all are welcome. Improvements to the park, including fenced small and large dog enclosures are planned in the near future. Are there restrooms at the Vero dog park? Thanks! A SHOUT OUT TO FOREVERFAMILYPC.COM (PET CREMATIONS). FOR MAKING OUR HEARTBREAKING LOSS OF DYLAN, BEARABLE. I’m wondering if you are not maintaining this website or have moved out of the area? Dog Park has been fenced! Also, there is no no longer the greenhouse cafe. It has been a Oceloa for a couple of years now. Great place to dine with or without dogs. They will even bring you dog their own water bowl and give you hand sanitizer right at your table. riverside cafe on the back deck is also dog friendly. Thank you so much for putting this list together! I am moving to Vero in a couple of months and am needless to say worried about my dog, Quinn. This is a great start for me! I see you don’t use the potential of social websites like facebook on your site. Marbella is traditional wedding photography. I heard turtle beach was also dog friendly, but im not sure, so i wanna know if anyone could find out for me? We take our 3 dogs to turtle beach and everytime we go we see other people with dogs. Technically it does have a no dog sign but everyone who ive ever seen there seems really laid back and not to mind. 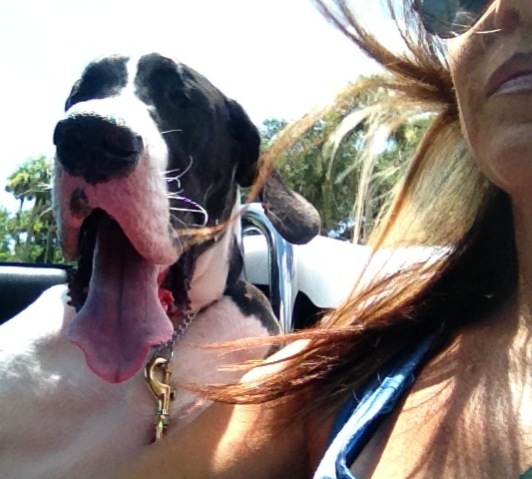 Just an FYI…..Sea Spray Inn does NOT take dogs, even certified service dogs. We called and asked for one night with our 2 certified service dogs (all legit paperwork, etc.) and were flatly refused. I suppose we could have insisted as it is illegal to turn anyone away with a handicap assist dog, however who wants to stay where they are not welcomed? Besides, far better places in Vero that will HAPPILY take your dogs, certified or not. Thank you Caribbean Court Hotel!